Mike Day had been shot at plenty of times during his two decades as a Navy SEAL, but he had never been hit. That changed dramatically the night of April 6, 2007. Mike was part of a 22 member assault team tasked with striking an al-Qaeda cell responsible for shooting down several Marine helicopters. Mike was the first through the door and was immediately met with a hail of bullets by terrorists firing AK-47’s, an M-4 and pistols. Mike was hit and fell into the 10 square foot room. Of the two Iraqi allies behind him, one was severely wounded and the other was killed. 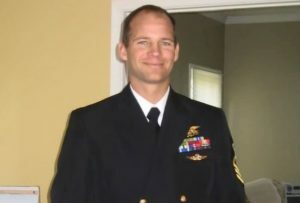 Fellow SEAL Clark Schwedler was hit in the back of the neck and died on scene. His rifle shot from his grasp, Mike transitioned to his pistol, killed one terrorist and then engaged a second terrorist who had pulled the pin on a hand grenade. The explosion knocked Mike unconscious. Miraculously, Mike completed clearing the house and then WALKED HIMSELF to the evacuation helicopter. The total elapsed time of the shootout was 16 minutes. Mike also shares his thoughts on Veterans transitioning out of the military and civilians dealing with trauma in their life.